Availability: In Stock., 99999 Available. The TARDIS is made of heavy b flute cardboard. With the roof, it stands at about 108" tall, but the roof is an optional piece if the ceilings will not allow for the additional height. 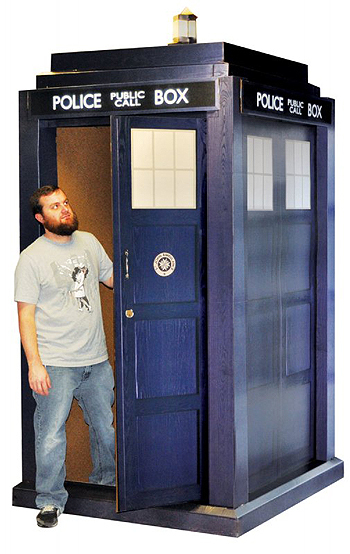 Without the roof, the Tardis will fit under a standard 8 ft ceiling. The door has a plastic handle and opens similar to an actual Police Call Box. The inside of the TARDIS is a kraft/brown cardboard backing. Requires approx. 2-3 hours for assembly. Parts include cardboard, plastic handle and plastic plugs that are used to secure pieces together. PLEASE READ THE FOLLOWING: Shipping is included in the price of this item. This item is NOT stored at our warehouse and NOT available for local pickup. Shipping is handled exclusively by the manufacturer. This item can be shipped within the continental USA only. If, after placing your order, we are notified this item is no longer available, you will be refunded. 1) May I add other items to my basket? A: Yes. During checkout, please select the shipping method you prefer for those items during checkout. We will arrange the delivery of your standee independant of the other items you order from us. 2) During checkout, with only a standee in my basket, it has "Do Not Ship/E-Certificate" as my only shipping method. Is this correct? A: Yes, the item will be shipped, the price of shipping is included in the item and no additional funds are needed to complete this transaction. 3) Do I need to contact the manufacturer if there are any issues with my standee? A: No, contact us directly and we will handle any issues directly with the manufacturer. 4) May I checkout with Amazon checkout for this item? A: It is likely you will be unable to utilize Amazon checkout unless you have other items in your cart, as this is a zero-weighted item.